How to choose your parachute! Thinking about doing something…… maybe starting your own blog, maybe starting your new business, maybe doing a new task. Does it feel like you are at 15-20,000 feet looking out of a plane and not sure if it is time to step out or not! Wondering if that package strapped to your back that they call a parachute is really going to open? Jorja is a perfect example of how in life we are often confronted with situations which feel like we might as well be standing in that plane contemplating the jump. The difference in life is we all have one parachute that WILL always open. That parachute is your community. Why can I say this with conviction…. because it has been proven over and over again. The story behind how I got to doing this blog and the formation of the Samuel Morris Foundation are prime examples of a community rallying behind someone standing on the precipice and in every disaster we see communities rally around to support people who need assistance. Communities support people in a multitude of ways every day, more often than not in unseen and often unacknowledged ways. There are many terrific examples in the blogosphere of communities supporting each other. I am part of a few communities out here in the interweb thingy…. where I really am still a complete newbie….BUT communities like the Third Tribe, that inspired by James at The Infopreneur, the community being supported by Sean D’Souza at 5000BC (via psychotactics) are full of amazing people who either directly or indirectly are having a significant influence on what I am doing, not just here at the blog, but in my other undertakings and in life in general. Sometimes we can feel like we are all alone and that nobody really gets where we are at. In reality we are all part of many communities, and those communities are full of people who are ready and willing to support you in growing and taking those chances that have you scared and wondering if you are really prepared to jump or not. How do we choose our parachute? We already have in many ways, our parachutes are our relationships with the people and places that we hang out with and in, they are the people and places that we have invested our time and energy in, they are the people and places who we have helped out in the past, and who may have helped us out in the past. We are not limited to only those communities, as there are also many new communities like the ones mentioned above that are waiting for you to find them. These are communities of people and places that are full of information and advice we need to help us succeed, and full of potential relationships that could change our lives forever. Regardless of whether it is a community that we are already a part of, or a community of which we are wishing to become a member they are a community because they share desirable characteristics with us and if we spend time building relationships within those communities they make a parachute that is guaranteed never to fail us. It would be great to share some examples of parachutes that have prevented us from going SPLAT and created a soft landing for us. So let us know in the comments who represents your parachute. This entry was posted in Resilience and tagged Community, fear, learning, Resilience by Mick Morris. Bookmark the permalink. You’ve mentioned some pretty amazing communities, Mick. I think jumping not only expands your parachute, but it expands your mind, your creativity and your horizons. After all, you can see so much farther (and clearer) when you’re thousands of feet above the everyday bustle of daily tasks. Thanks Julie Anne, they are great communities, they help me soar and provide the canopy to ensure a soft landing on my target! One thing I like about the communities you mention, Mick, is that they up the ante for all of us, keeping us creative and pushing our own comfort zones in our respective blogging work. They take the time to ponder and comment on the work we do, and as such, create a valuable network of ideas and inspiration. When parachuting, YOU also have to leap. Same as being part of a community. It’s about jumping and and committing to self-expansion, to having something worthwhile to add to your new community and then going for it. We may all have different sources of inspiration, but what we make of it can be quite diverse and extraordinary. When everyone commits to excellence, we all benefit! You are right about having to contribute yourself. If you are just taking then you are not really a part of a community. It has to be a reciprocal arrangement. Sometimes in life Mick we just need to brave it and jump don’t we? 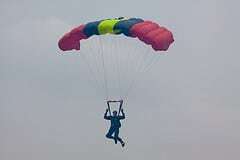 I had James from the infopreneur.net when I jumped and along the way my parachute has grown. so true, but once you have taken that step, it starts to feel easier as time goes on.